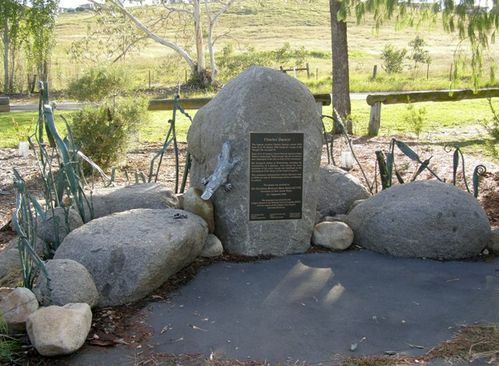 The monument commemorates Charles Darwin`s two day visit to the Wallerawang area in 1836. Wallerawang became a major stopover for those headed between Sydney and the farming areas beyond Mudgee and for those travelling between Sydney and Bathurst. One of the latter was famous natural historian Charles Darwin who stayed overnight at `Wallerawang` farm in 1836 as a guest of Mr Brown. Charles Darwin stayed at "Wallerowang House" (later to become Barton Park) in 1836, and in the book "Voyage of the Beagle" he describes the area at the time and the wildlife that included a number of platypus. The famous scientist Charles Darwin visited to NSW from 12 January to 30 January 1836 during his voyage in the "Beagle." He was aged 26. From 18 to 20 January Charles Darwin stayed at James Walke`s homestead "Wallerawang" the site of which is now submerged in the lake in front of this monument. His biological studies in Wallerawang, including the examination of a platypus, were among the most important of his entire voyage and significant to his development of his theory on the origin of species. This monument commemorates Charles Darwin's visit to NSW, his time in Wallerawang and his contribution to science.